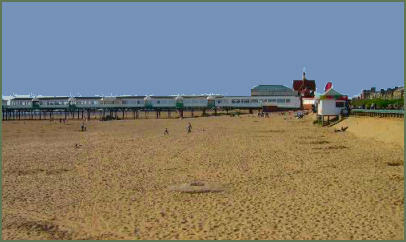 Lytham and St Annes-on-Sea, a classic seaside resort, are situated on the Fylde coast around six miles from Blackpool. The seaside towns lie on a picturesque stretch of coastline and have a boating lake and pretty parks. The sand dunes of St Annes-on-Sea and the estuary of the River Ribble adjacent to Lytham provide a safe haven for more than 250,000 migrating birds that flock to the area in winter. St Annes-on-Sea, a place of irresistible old fashioned charm, boasts a tastefully restored Victorian Pier, constructed of iron columns with lattice girder work, it was originally built in 1885 and is now home to amusement rides, shops and a café. The area has four championship golf courses which host prestigious tournaments such as The Open Golf Championships. St Annes Beach, which recieved the quality coast award in 2007, is justly famous for its extensive golden sands and is popular with kite surfers, traditional donkey rides are available. Extensive sand dunes lie at the northern end of the beach. A traditional seafront miniature railway runs along a rectangular route through the sand dunes. 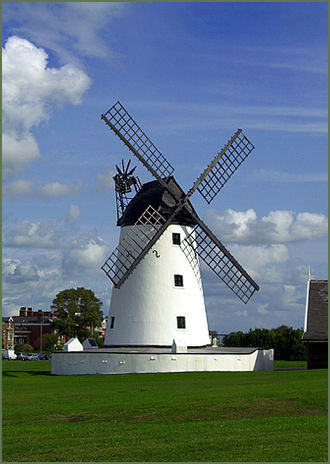 Lytham Windmill, (left) situated on Lytham Green is the town's best known landmark and is open to the public during the summer months, when it serves as a Tourist Information point. To the surprise of most visitors the Museum is like a "Tardis" in that it is much larger inside than expected. The Museum, which annually attracts an average of 20,000 visitors from all parts of the world, was established in 1989 by Lytham Heritage Group. The museum houses exhibitions and displays spread over 4 floors, including explanations of the milling processes and a history of the Grade II listed building. The basement shows a tableau of life in Victorian Lytham. There was a windmill in Lytham as early as 1327. The present windmill is built in the distinctive Lancashire style, a white-painted tower mill of four storeys with a black boat-shaped cap. Entry is free of charge. Lowther Gardens are one of the areas major parks and is situated adjacent to Lytham Green. The site consists of mature gardens and contains a range of leisure facilities for all age ranges. Ashton Gardens is an attractive public park in the heart of St Annes and feature a rose garden and a rock and water garden. Clifton Street in the centre of Lytham has a range of boutiques, restaurants and shops. RSPB Ribble Discovery Centre-presents an interesting visitor attraction with interactive displays and volunteers who will explain all about the wildlife on the Ribble Estuary. St. Patrick's Chapel- ruined Saxon chapel dated to the late sixth or early seventh century.